In this tutorial, I'll walk you through creating the membership products (the videos) and one for all of the videos (all access membership) in 4 easy steps. I'll show you how to install the members addon, restrict the content and show you a few tricks of how to embed the videos using the popular Avada theme. Almost all commercial themes make embedding videos very easy these days. They even will allow them to display them in a grid using posts which can save a lot of design and development time. I'll also show you how to create a members landing page where we show new customers a way to purchase the videos and the logged in customers, the actual videos. There are really a lot of different ways that you can sell access to videos or video downloads using Cart66 Cloud. In my opinion, the easiest thing to do (and most reliable for the end user) is to actually embed the videos on a page and then restrict that page using the Cart66 Members Addon. The member's addon is no longer in core so you will need to install this addon separately. Don't worry, it's very easy. One thing I want to mention is that I do not suggest offering a video as a download to the customer. While Cart66 Cloud will have all of the features you need to do that, it comes with a few inherit problems. How big are the videos? (there is a 1GB file cap in Cloud) and do your users have something installed on the computer that will actually let them view the video? (its normally 50/50 on that.) But nothing is more frustrating to a user than buying a new video, having to download software and then hitting a roadblock where they can't view the video they just purchased. For that reason alone, we're going to embed the videos. And we're going to use YouTube or Vimeo to host the videos because not all browsers support video players and you may not be able to easily offer controls like Pause, Fast Forward, Stop, Play etc... And it's free. The first thing you should do, is choose who you will post the videos with. I suggest YouTube or Vimeo. You can make the videos your post to both of those "private" so if a user stumbled across the video, they could not view it for free. Google will provide loads of info on how to post videos. I don't want to get into the details here so my suggestion is to follow this help article if you are using YouTube. Vimeo has some great help docs as well. You should have no problems posting the video. Login to your Cart66 Cloud Dashboard and navigate to the Products tab to the lower left. Click the +Add Product button in the top right hand corner of the Dashboard. Enter a product name. I like to use "Video 1 - series 1” or the like for this, but you can all it whatever you wish. Same for the SKU. Use whatever works best for you but be sure to use something that make sense and is cohesive with the product name. We’ll use “video1” for the SKU in this example. Note: You will not need to fill out any other fields on this page unless you want to create some custom Receipt Text which is certainly a great way to cross market other videos or products. Ideally you should add some HTML that includes a link to the login page or the videos home page. If you make a test transaction here, you will see what I mean and get a good feel for how it works. Click on the Membership tab if you want it to be a membership. You can read more about creating a membership product here. 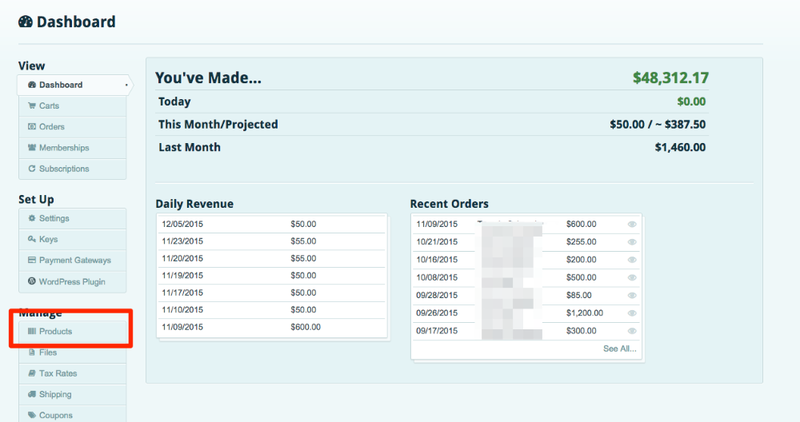 Click on the Subscription tab if you want billing to recur. You can read more about creating a subscription product here. NOTE: Memberships and subscriptions have the exact same functionality except the subscriptions will recur. Go ahead and do this for each product you want to sell. Let's go ahead and install the members addon. We'll need it for the next step. You can download the addon and read more about it here. You install it just like any other plugin. Once you have the addon installed we can add the products to WordPress. 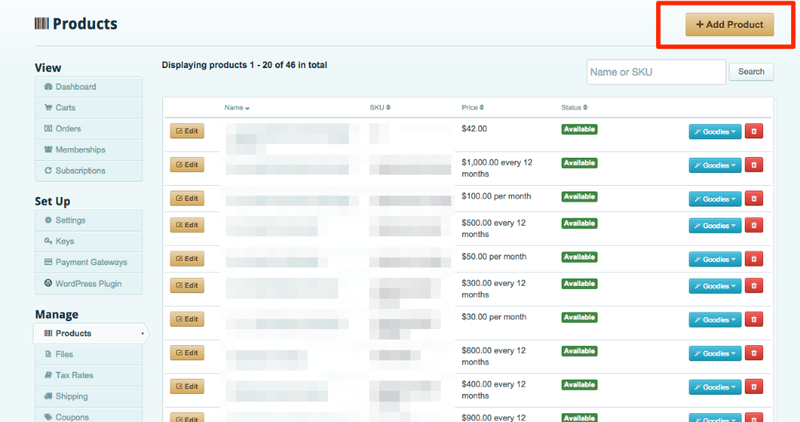 There are a lot of ways to add the products to WordPress. In this step you will need to create the members landing page, the Access Denied Page and each videos page. We are using the Avada theme here, but almost all themes have similar features these days. This is where the videos will reside. In this example, I am using posts because the Avada theme (and almost all themes) will offer a grid feature for a portfolio of videos or a shortcode to show all posts in a particular category. Create a post for each video. Embed the video how you like. In Avada, there is actually a video embed option on each post. 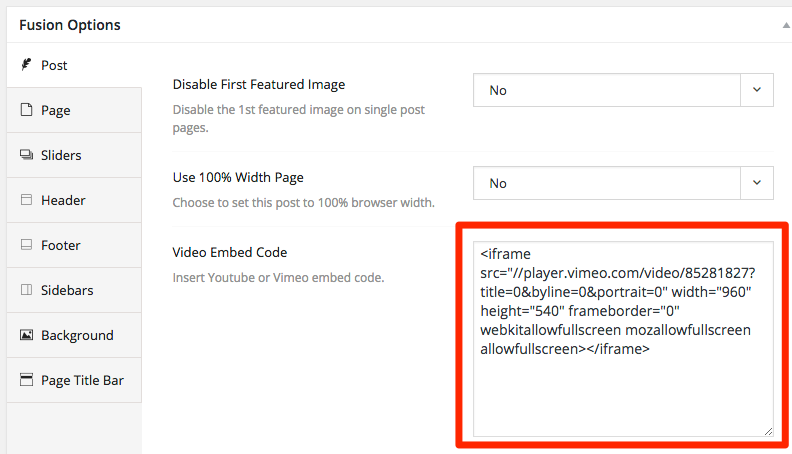 Just paste the embed code from YouTube or Vimeo and you're done. This next step is critical. 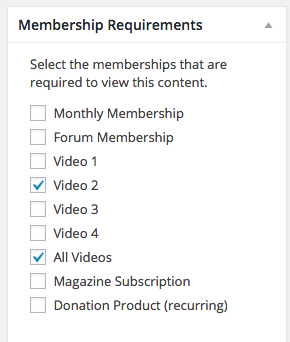 In order to restrict the videos you need to check a box on the post that will connect the video on the page to the actual membership product you created. We also created an All Videos product that would include every video you sell. So you need check the box for the membership as well as the All Videos. NOTE: if these boxes are not showing up, Go to the Main tab under Cart66 in your WordPress admin area. 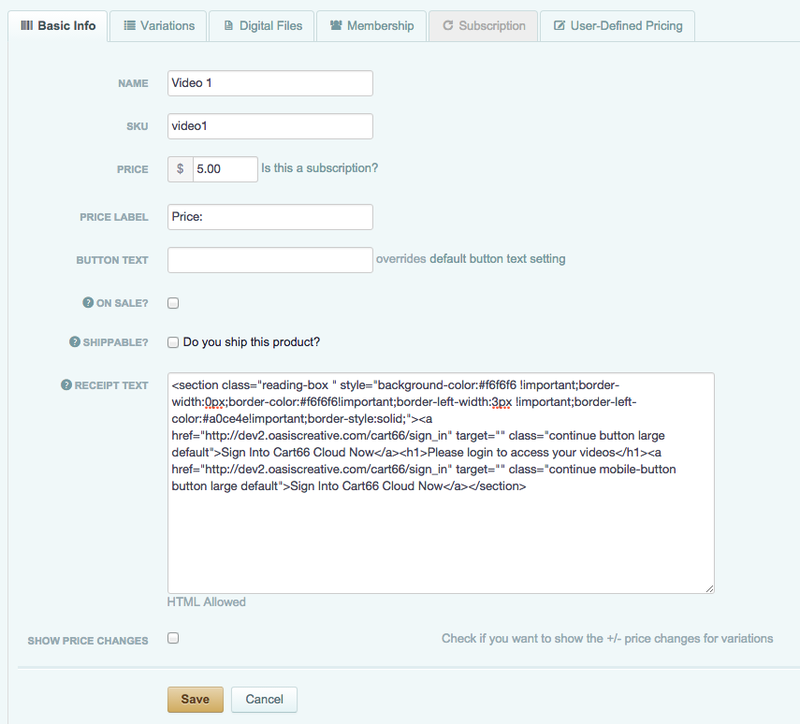 Just check the box to load the scripts on the page types you have added your products too. Meaning, if you added products to a page or a post, you have to check the page or post box. We do this so that the required scripts for Cart66 won't load on every page of your WordPress site which really helps with speedy site performance. Just check the appropriate boxes. In this case, check Post. This is the page where a user can view their purchased videos. Think of it as a catalog of videos. 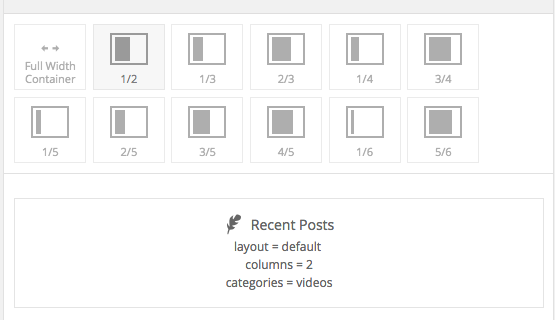 In this tutorial we are using Avada which has a very easy way to show all posts in a category. Since you created a post for each video in the step above, this should be very easy. A lot of themes are using page builders these days and I know similar features are included in almost all of them. Check your theme documentation on a way to do this. I am certain there is an easy way. If not, there are grid plugins you can use as well. You can see in the screenshot below how we used the Videos category from the previous step to show the videos in the grid in the shortcode or page builder element. 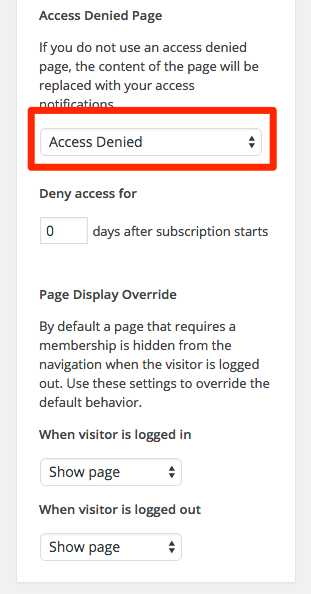 Go to the Members tab under the Cart66 settings in WordPress admin. Here is where we will set the members home page. This is where users will get directed after login. You can also create a default message to users that have not logged in yet. Add your pricing, a link to your customer portal (yoursite.com/sign-in) and any welcome message you want. Next, we need to mark this page as the Access Denied Page so that Cloud knows where to redirect users that are NOT logged in. Here is where it gets a little tricky. So we created a Members Home page. In this example I've been calling it "Sell Videos". Whatever this page is called where you host all of your videos, we want to attach our Access Denied Page to it. That way when the users lands on this page and is not logged in, they will get custom content. On that page to the right, is a metabox as seen below. There is a drop down menu where you can select your access denied page. Select your page there. Congratulations! You have created your products in the Cloud, embedded videos in posts, created a catalog of all your videos and have successfully restricted them to paid customers only. Be sure to send us your examples or shoot an email to help@cart66.com if you have any questions.